Well, it finally happened this week, with Mars and Jupiter so bright in the night sky, I just had to try out the old Barlow lens to getter a better view. Readers will recall that the 600mm images in the August 3 post were just fuzzy balls of light, so this week it was time to bust out the 2.5x Barlow and try to get it to work with the 80mm refractor telescope, which should result in an equivalent focal length of 1400mm. Previous attempts at trying out the Barlow just resulted in frustration in that I could never get anything to focus. After searching the internet for help I found that the Barlow installation needs the correct spacing to work properly and this results in a wild combination of tube spacers and extensions. One lesson learned was to first of all start off with a non-moving target, like a distant street lamp. 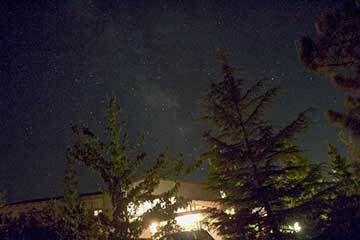 Try as I might, I could not get the DSLR/Barlow/Telescope combination to focus properly. The telescope focus control just did not have enough motion to get a good focus. I tried several tube extensions that were available, including a 2 inch extension and an adjustable 4 inch extension. I could not get any of these extensions to help and I wondered if I was going to have to get more longer tube extensions. But, I recalled that one internet post (sorry, I can't remember where) said something like you have to also have to install a tube extension between the scope and the Barlow. Wow, finally, now with the 2 inch extender installed before the Barlow, that worked and I could achieve a good focus with just about 1/2 inch margin remaining on the telescope focus. Now if was time to do a quick telescope alignment and slew the telescope to Jupiter. I didn't bother about getting a really good alignment and just relied on my sense as to where the North Star was because I couldn't see it visually anyway. 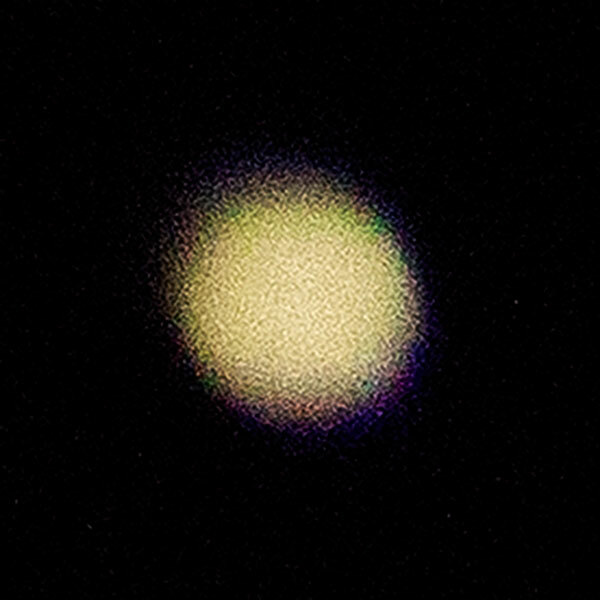 It took me several minutes to actually get Jupiter in the DSLR LiveView and had to do some final refocusing. Then with the DSLR electronic magnification in LiveView set to 10X times, I could make out the rings of Jupiter's atmosphere. Everything was looking really good, so I snapped a couple of images using 1/30 second and 1/60 second exposure settings. Then sadly, when I reviewed the images, none of Jupiter's rings were visible and all there was in the image was a big fuzzy blob. Darn! What happened? Yes, the scope and mount were very sensitive to vibration and even just touching the DSLR command screen resulted in wild movement of the target, but the mirror was locked up and I used a cable shutter release, but still not so good. The atmospheric seeing caused the LiveView image of the rings to sort of come and go, but none of the images I snapped showed any rings. You can check out the typical image below. Well, as disappointing as that image is, at least readers of the August 3 blog post will recognize that the image of Jupiter is at least 4 to 5 times bigger than was seen with the 600mm telephoto lens. 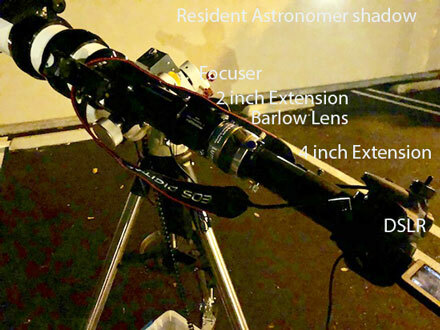 The 2.5x Barlow is supposed to magnify the image 2.5 times, but some internet posts indicated that the magnification was also a function of the length of extension tubes added. So there is still something about using a Barlow lens that escapes me. All of the images of Jupiter and Mars in this post are cropped to the same background size as in the previous August 3 post. So, that at least was encouraging, but the poor image quality was quite disappointing. Was it do to bad atmospheric seeing or what? I could see the bands in LiveView, but they are completely washed out in the image. Ok, let's move on over to Mars and see if that turns out any better. Nope! 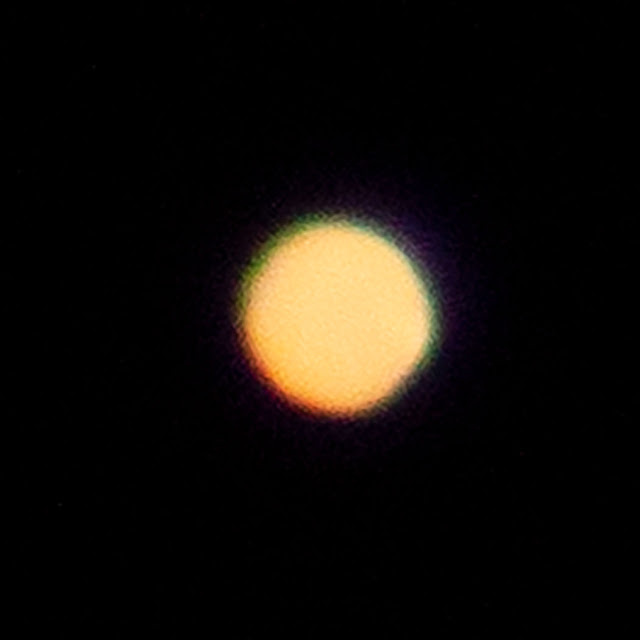 The image below of Mars is quite fuzzy, but again at least it is about 4-5 times bigger than as seen with the 600mm telephoto lens. Again there is some slight oversaturation in both images and I wished I would have taken some images with just 1/2 as much exposure time. But when I looked at using the shorter exposure time, the images in LiveView seemed so dim that I didn't actually snap any images. Darn! Ok, well at least the focus lesson worked out ok. If you are interested in the final scope setup, check out the image below. You can see the 2 inch extension mounted directly to the scope and the Barlow lens connected in after that. Then the adjustable 4 inch extension as added on and finally the DSLR plugged right into that. The whole scope was now quite long and I had to rebalance the scope to prevent the mount from wimping out on too high of torque. Also I have no real sense as to how one is to actually set up the Barlow other than just a series of trials that I went through and I have not run across any well defined explanation or instructions about what one is supposed to do. So, all in all it was a disappointment, but at least one combination in tube spacers resulted in being able to focus the Barlow. We got some images of Jupiter and Mars, but forgot to try the Barlow out on Saturn, which was also visible at the time. Darn! One lesson learned was that the viewing now was very sensitive to any mount or camera motion or any jiggling of cables. Another lesson learned was don't pick your viewing location where within about 45 minutes the target will move behind one of the neighboring chimneys. Yep, that happened and I had to roll the tripod to a location about six feet away. Oh well, at least I hadn't spent a lot of time on doing a real precise alignment!